Commissioned by banker Clyde M. Church, the C.M. Church House was designed by Henry John Knauer in 1912. 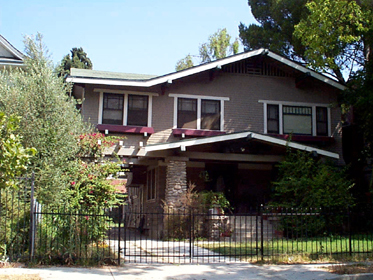 The two-story Craftsman residence makes a strong design statement with the use of Arroyo Stone in its porch from the stoops and railing to its support pillars. The house presents a very formal appearance with its crisp detailing, including upper story window boxes, to its porte-cochere.